Start Point: Public car park in Tarfside. GR: NO 493797. There are public toilets here. Grading: This is a long and remote, open walk over rolling, rough and heathery hills suitable for fit adults and older children. 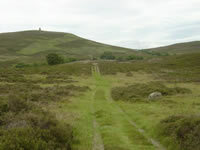 Unless taking a short diversion to the Monument on Hill of Rowan, the route is entirely on good vehicle tracks with one very short section of quiet road walking. The total ascent over the route is around 2,500 feet/760m. 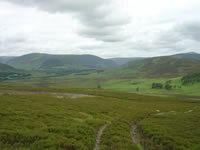 Glen Esk is divided into three privately owned estates where the main interest is sporting - grouse and pheasant shooting and deer stalking. The route crosses open moorland used in pursuit of these sports and during the grouse shooting season in particular (August 12 to December 10) it is worth checking with the Millden Estate before setting off - unless going on a Sunday when there is no shooting. The head keeper's number is 01356 670267. There is very little shelter to be had over this route therefore care must be taken to ensure that proper footwear and clothing is worn. 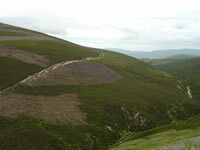 A good summer route but in winter weather or low cloud, a map and compass, and the ability to navigate with them effectively may be required due to the many paths which crisscross the hill. Dogs should be kept to heel or on a lead. 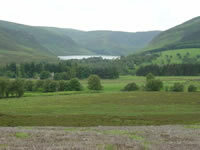 Glen Esk is the longest and most easterly of the Angus Glens that penetrate into the eastern side of the Scottish Highlands - glens that once provided sanctuary for historical greats such as William Wallace, Robert the Bruce, the Marquis of Montrose and Viscount Claverhouse. It boasts its own customs and strong sense of community. It is easily accessed from the B966, Edzell/Fettercairn road off the A90. There is no through road, but possibly this has helped to protect its unspoilt character. A short distance before the hamlet of Tarfside is the Retreat - a folk museum that holds a large amount of archival material and artefacts from the Glen, which give a picture of the way the people lived and worked in the bygone days. Although there may be fewer people living in the glen now, there are three churches, a Masonic Lodge and a primary school. Archaeological and historical landmarks, with their own stories, are an important part of the culture and landscape of the area. On the Hill of Rowan, a short distance to the east of Tarfside can be seen the outlines of Bronze Age settlements, three thousand years old. The Rowan Tower, also on the Hill of Rowan and properly called the Maule Cairn, was built in 1866 by Fox Maule, 11th Earl of Dalhousie. It was erected as a memorial to deceased members of his family, including his brother Lauderdale Maule, M.P. who died of cholera during the Crimean War. The glens now offer the opportunity to see and walk on the mountains, yet be only a short drive away from busy towns and cities! Today, they are a popular venue for getting away from it all! Starting in the hamlet of Tarfside, head out of the car park on to the road and turn left, cross the bridge over the Water of Tarf then follow the tarmac to where it is signed to the left for Invermark then join the grass track that leads directly ahead up to and through a gate. About ¾ of a mile/1.25km along this track a faint path leads off southwest (left) up the gentle slope of Hill of Rowan following the fence line to the summit and the Rowan Tower. From here, an obvious double track leads away northwest down into lush pastureland around the deserted cottage at Westbank. The path divides around the building reforming later at a gate in a fence. A pleasant, very gently descending wide track leads from here, through another gate to a third gate at the roadside just short of the hamlet of Invermark. 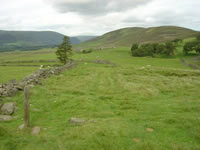 Pass though the gate and walk some 100 yards/90 metres along the road then turn right up the drive to Auchronie Farm. Continue (quietly) through the steading, through a gate behind a large shed, then out northwards onto a very gently inclined path up the hillside with the Burn of Branny below on the left. Just less than a mile/1.5km up this track there is another gate after which the ascent becomes almost negligible. 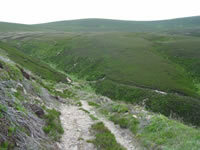 Once over Hill of Saughs, the path takes a short, but steep, descent to ford a stream then climbs equally steeply for a short distance before levelling out again to pass below the summit of Hill of Gairney on its easterly aspect. There follows a gentle descent to pass though one or two small fords where the route reaches its most northerly point before turning east then south for the return to Tarfside. There are a further two short, steep declines and following inclines to negotiate over the next 1½ miles/2.5km each with a stream to cross. The second of these is by a bridge over the Burn of Adedazzle! Stay on the wide, sometimes rough track that soon descends to pass the ruins of a settlement at Glencat then bear off easterly (left) over a lush grassy area and ford the Burn of Cat onto a gently rising route over the lower slopes of Red Shank. Head up to a gate in the fence line. Pass though the gate and after a short distance turn southerly again, fording the Burn of Keddloch on the way. There is one more gate to pass through before joining the Fungle Road and continuing to descend over the Burn of Clearach - by a footbridge a little downstream of the ford - to gently rise again to reach the cottage and single outbuilding at Shinfar that is out of sight until rounding the western end of a small stand of trees. The Fungle Road is an ancient highway linking Glen Esk with Deeside in Aberdeenshire and dates from around the 13th century. 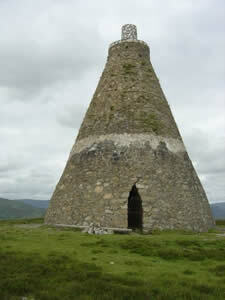 It was once a busy trade route but nowadays, however, it is the preserve of hillwalkers. 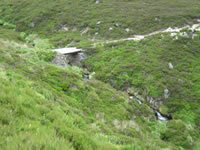 The way is grassy underfoot as it leaves the cottage and descends gently to cross a bridge at a junction - where a green Scottish Rights of Way sign indicates the route northwards - and then becomes a rough, wide vehicle track again leading out to the hamlet of Tarfside and the end of the circuit.